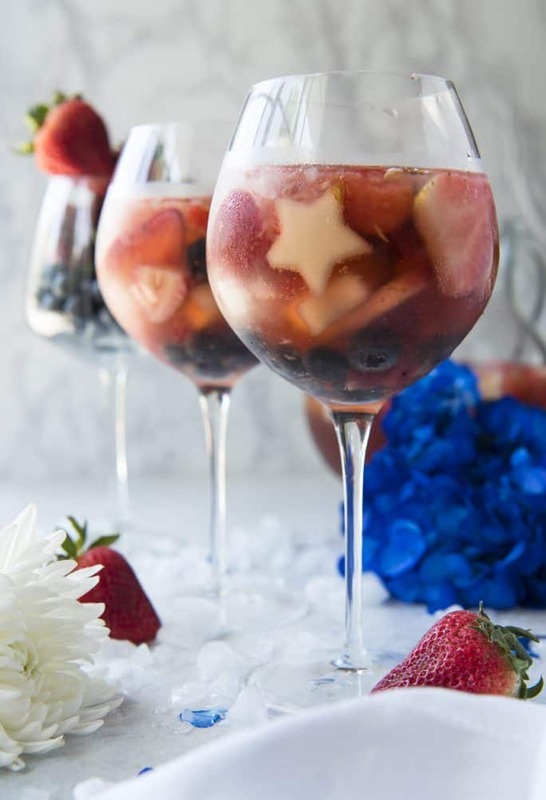 This patriotic Red White & Rose Sangria is the cool, refreshing cocktail you need this summer! A dry rosé wine base, naturally sweetened with watermelon, berries, and pear, is chilled with orange liqueur and tequila before being served with sparkling water and lots of crushed ice. Guys, I am literally living for sips like this right now. After ten days of nothing but gray skies and over 10 inches of rain, Florida finally found its sunshine again. Now, if you’ve spent any time reading over much of my blog posts, you’ll find a pattern. I’m a displaced Buffalonian (albeit one technically born 20 minutes from where I live) and unlike the snowbirds that move down here on purpose, I can’t stand the humid, mosquito-infested triple-digit “feels like” hot days we endure 2/3 of the year. I am not a beach bum. I’m more hermit than hiker. I like owning and wearing more than just flip flops and tank tops all year. Truly, if it weren’t for Disney being so close, I’d really have no reason to stay. 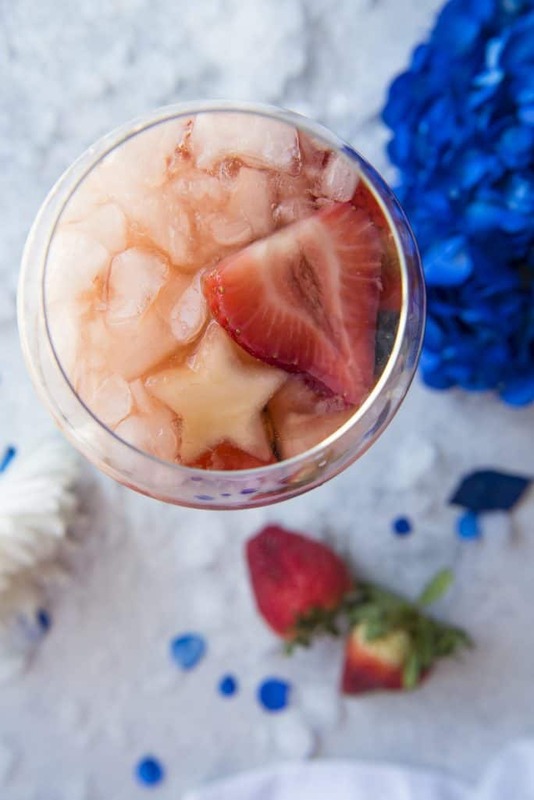 Drinks like this patriotic Red White & Rose Sangria make summers down here bearable. In spite of my penchant for staying inside on sticky days, I still like to enjoy the thought of summer. I’ve never really experienced any extended summer season outside of my home state. Please correct me if I’m wrong, but I feel like days on the lake or on a beach up North somewhere are just more pleasant. I just can’t comprehend the allure of Florida to tourists (again – outside of the theme parks). Hurricanes, sharks, and crazy people doing crazy things. That’s what we’re known for. So what draws people in? The answer is sangria. And the (completely unrelated to the previous conversation) question? How to get me to sit down by the pool for a chat or have lunch on the patio. 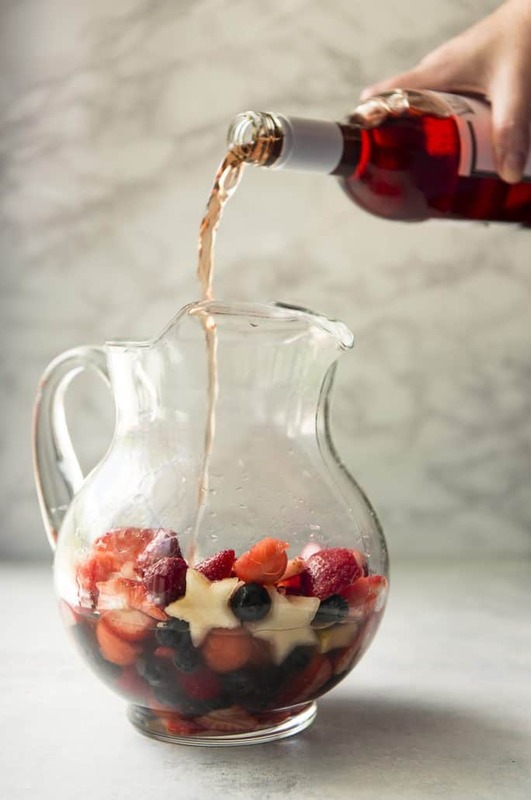 You just better make sure a cool summer sangria is involved. 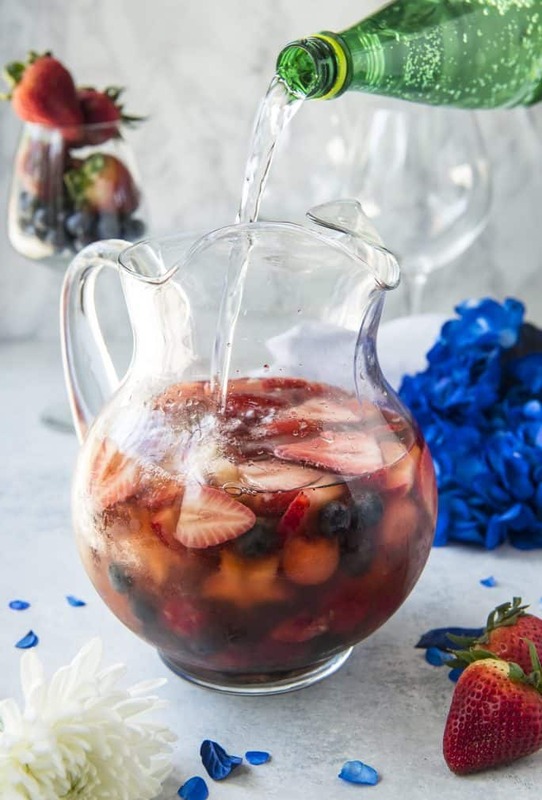 This easy sangria recipe is totally perfect for all your summer celebrations – Memorial Day, graduations, Father’s Day, Independence Day, Labor Day. Throw in a few birthdays, weddings, and baby showers and you’re covered for cocktails until the leaves start to fall. 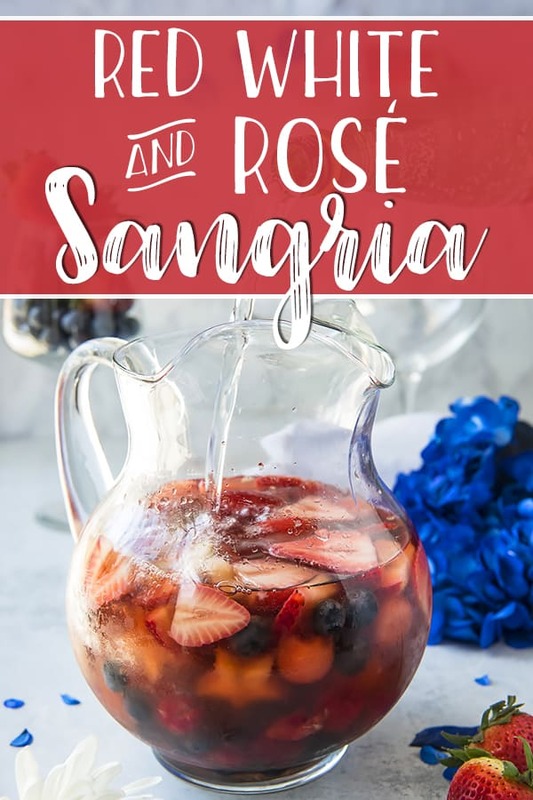 I couldn’t resist using a rosé in this one, since I’ve used just about every other kind of wine in my sangria recipes over the years. The pretty, popular blush variety was just sitting in my wine cabinet begging to be poured into this festive pitcher! Rosé (rosato in Italy or rosado in Spain) is it’s own type of wine. Not quite red nor white, it is tinted by brief contact (we’re talking hours vs. weeks), blending, or bleeding (saignée method) of the grape skins during the fermentation process. It can be dry or sweet, still or sparkling, and is possibly the oldest type of wine thanks to ancient winemaking techniques. Guys, remember your Mom’s big pink bottle of Sutter Home White Zin (which, if you’re anything like me, was your first taste of alcohol?) That’s a pale rosé. We Millennials simply brought it back the best way we know how – kind of like flannel and those God-awful high-waisted jeans that won’t go away. The rosé we drink now is way better than that bottom shelf stuff, though. The best wine for sangria is your favorite type! Reds, whites, and roses can all make deliciously different sangrias to please every palate. Just be sure to balance the wine properly with the fruit and any additional liqueur you add. For dry wines, a little simple syrup, grenadine, or triple sec adds nice flavor. If you’re using a sweeter wine, mellow it with some tart citrus. And avoid oaked wines for the freshest taste – save that Chardonnay for another use. With that said, don’t use a wine in your sangria that you wouldn’t drink otherwise. That means the bottle your cousin got you five birthdays ago with the twist cap. Sure, fruit and sugar will make it better – but why waste the calories (and a sliver of your liver) on bad vino? You don’t have to break the bank on your wine choice since you’re going to muddle any complexity with fruit. Savor that $70 Sonoma bottle on its own. Taste as you go when adding sugar. The sangria fully comes into its own after a few hours, but don’t just dump sugar in without tasting it. If you aren’t a fan of adding sugar, you can sweeten a dry sangria with fruit juice, agave nectar, or flavored tonic water. Don’t forget the fruit! Choose fruit that is complementary to your wine. Rosé wines are typically flavored with red fruit, flowers, citrus, melon, and sometimes celery. 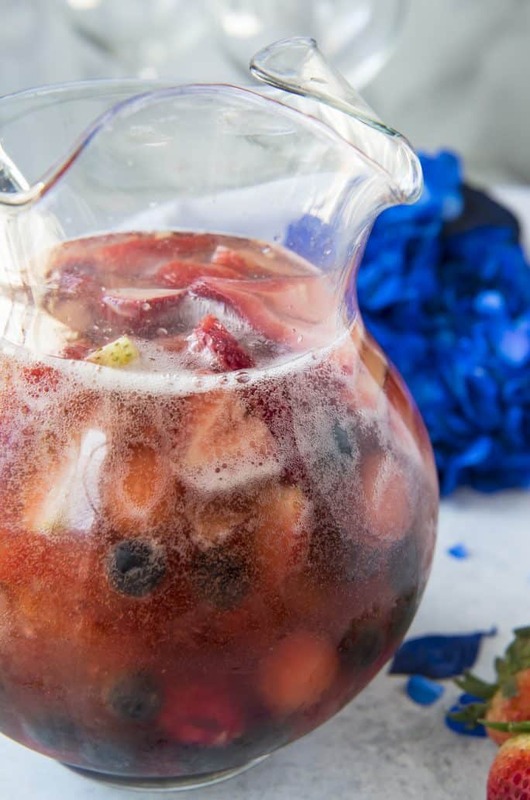 I chose strawberries, raspberries, blueberries, watermelon, and pear for this rosé sangria recipe. I also mixed it with an orange liqueur and topped it off with a lime sparkling water for those citrus notes. Be untraditional. Many sangrias call for brandy as a mixer – often to amp up the alcohol content when mixing it with tonic or seltzer water. Brandy is fine – but rum, vodka, and tequila bring interesting flavors to the pitcher, also. Love summer cocktails? Here are a few more to wet your whistle with! Peel the pears, then slice each one lengthwise into 4 pieces. Use a small star-shaped cookie cutter to cut 1-2 stars from each piece, removing seeds as necessary. 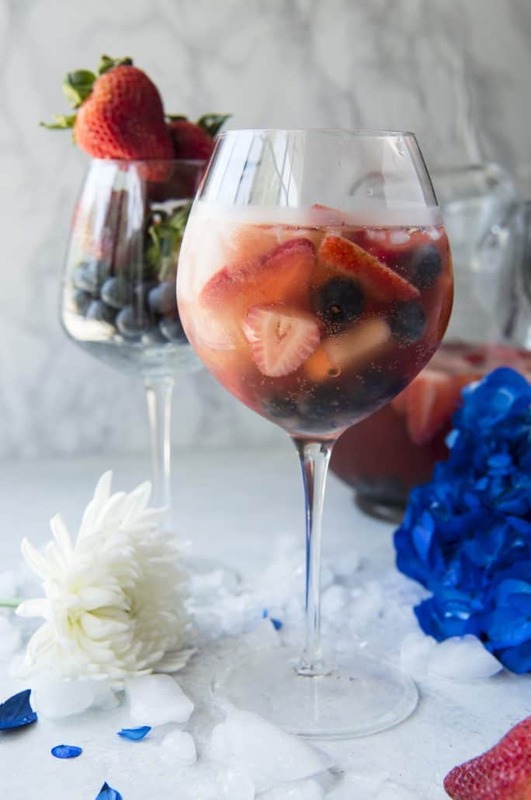 Combine rosé, orange liqueur, tequila, strawberries, raspberries, blueberries, watermelon, and pear stars in a large pitcher. Mix well, then chill at least 2 hours, or up to 6 hours to let the flavors infuse. When ready to serve, add the sparkling water to the pitcher and stir well. Portion into large red wine glasses, then top with crushed ice. 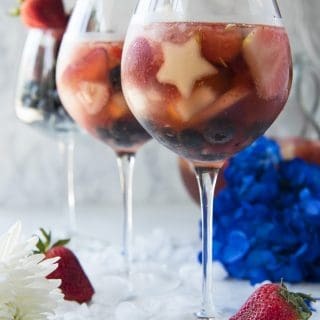 PIN THIS PATRIOTIC ROSE SANGRIA RECIPE FOR LATER!